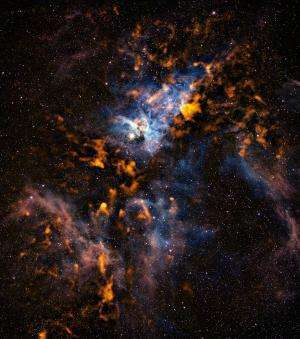 (PhysOrg.com) -- Observations made with the APEX telescope in submillimetre-wavelength light reveal the cold dusty clouds from which stars form in the Carina Nebula. This site of violent star formation, which plays host to some of the highest-mass stars in our galaxy, is an ideal arena in which to study the interactions between these young stars and their parent molecular clouds. Using the LABOCA camera on the Atacama Pathfinder Experiment (APEX) telescope on the plateau of Chajnantor in the Chilean Andes, a team of astronomers led by Thomas Preibisch (Universitats-Sternwarte Munchen, Ludwig-Maximilians-Universitat, Germany), in close cooperation with Karl Menten and Frederic Schuller (Max-Planck-Institut fur Radioastronomie, Bonn, Germany), imaged the region in submillimetre light. At this wavelength, most of the light seen is the weak heat glow from cosmic dust grains. The image therefore reveals the clouds of dust and molecular gas  mostly hydrogen  from which stars may form. At -250ºC, the dust grains are very cold, and the faint glow emanating from them can only be seen at submillimetre wavelengths, significantly longer than those of visible light. 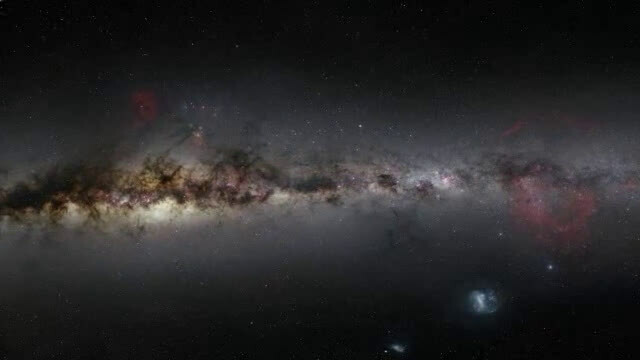 Submillimetre light is, therefore, key to studying how stars form and how they interact with their parent clouds. The APEX LABOCA observations are shown here in orange tones, combined with a visible light image from the Curtis Schmidt telescope at the Cerro Tololo Interamerican Observatory. The result is a dramatic, wide-field picture that provides a spectacular view of Carina's star formation sites. The nebula contains stars with a total mass equivalent to over 25 000 Suns, while the mass of the gas and dust clouds is that of about 140 000 Suns. However, only a fraction of the gas in the Carina Nebula is in sufficiently dense clouds to collapse and form new stars in the immediate future (in astronomical terms, meaning within the next million years). In the longer term, the dramatic effects of the massive stars already in the region on their surrounding clouds may accelerate the star formation rate. High-mass stars live for only a few million years at most (a very short lifespan compared to the ten billion years of the Sun), but they profoundly influence their environments throughout their lives. As youngsters, these stars emit strong winds and radiation that shape the clouds around them, perhaps compressing them enough to form new stars. At the ends of their lives, they are highly unstable, being prone to outbursts of stellar material until their deaths in violent supernova explosions. A prime example of these violent stars is Eta Carinae, the bright yellowish star just to the upper left of the centre of the image. It has over 100 times the mass of our Sun, and is among the most luminous stars known. Within the next million years or so, Eta Carinae will explode as a supernova, followed by yet more supernovae from other massive stars in the region. These violent explosions rip through the molecular gas clouds in their immediate surroundings, but after the shockwaves have travelled more than about ten light-years they are weaker, and may instead compress clouds that are a little further away, triggering the formation of new generations of stars. The supernovae may also produce short-lived radioactive atoms that are picked up by the collapsing clouds. There is strong evidence that similar radioactive atoms were incorporated into the cloud that collapsed to form our Sun and planets, so the Carina Nebula may provide additional insights into the creation of our own Solar System. The Carina Nebula is some 7500 light-years distant in the constellation of the same name (Carina, or The Keel). It is among the brightest nebulae in the sky because of its large population of high-mass stars. At about 150 light-years across, it is several times larger than the well-known Orion Nebula. Even though it is several times further away than the Orion Nebula, its apparent size on the sky is therefore about the same, making it also one of the largest nebulae in the sky. The 12-metre-diameter APEX telescope is a pathfinder for ALMA, the Atacama Large Millimeter/submillimeter Array, a revolutionary new telescope that ESO, together with its international partners, is building and operating, also on the Chajnantor plateau. APEX is itself based on a single prototype antenna constructed for the ALMA project, while ALMA will be an array of 54 antennas with 12-metre diameters, and an additional 12 antennas with 7-metre diameters. While ALMA will have far higher angular resolution than APEX, its field of view will be much smaller. The two telescopes are complementary: for example, APEX will find many targets across wide areas of sky, which ALMA will be able to study in great detail. APEX is a collaboration between the Max-Planck-Institute for Radio Astronomy (MPIfR), the Onsala Space Observatory (OSO) and ESO. The operation of APEX is entrusted to ESO. the cold dusty clouds in the Carina Nebula . . .